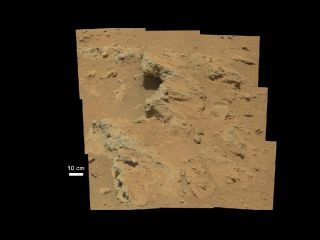 NASA's Curiosity rover found evidence for an ancient, flowing stream on Mars at a few sites, including the rock outcrop pictured here, which the science team has named "Hottah" after Hottah Lake in Canada’s Northwest Territories. This image mosaic was taken by Curiosity's 100-millimeter Mastcam telephoto lens on its 39th Martian day, or sol, of the mission (Sept. 14, 2012 PDT/Sept. 15 GMT). A NASA rover's discovery of an ancient streambed on Mars is exciting, but it’s far from the first solid evidence that the Red Planet was once a warmer and wetter place. On Thursday (Sept. 27), scientists announced that the Curiosity rover had found rocky outcrops containing large and rounded stones cemented in a conglomerate matrix. The discovery suggests that water had flowed fast and relatively deep — perhaps hip-deep, in fact — through the area billions of years ago. "This is the first time we're actually seeing water-transported gravel on Mars," Curiosity co-investigator William Dietrich, of the University of California, Berkeley, said in a statement. But Curiosity's find didn't exactly surprise mission scientists. They chose to set the $2.5 billion robot down in the Red Planet's huge Gale Crater, after all, because Mars-orbiting spacecraft have spotted signs there of long-ago water activity — from channels and alluvial fans to minerals that form in the presence of liquid water. Perhaps the first compelling signs that the Red Planet's surface — a frigid and dry place today — once harbored liquid water came from NASA's Mariner 9 spacecraft. Mariner 9 launched toward Mars in May 1971 and later that year became the first probe ever to orbit another planet. Mariner 9's images showed canyons — including the enormous Valles Marineris, which is named after the spacecraft — and what appeared to be riverbeds. A succession of other NASA orbiters — from the twin Vikings in the mid-1970s to Mars Odyssey and the Mars Reconnaissance Orbiter (MRO), which remain active today — have spotted many more landforms that speak of long-ago erosion by liquid water. MRO has observed streaks in the Red Planet's Newton Crater that shift over the course of a few months, suggesting that water might even be flowing seasonally on Mars today. The evidence is also mineralogic as well as topographic. Instruments aboard MRO and other craft have detected water-associated minerals such as clays and sulfates in numerous locations across the Red Planet. Over the past decade, rovers have ground-truthed some of the observations made from orbit, strengthening the case for a wet ancient Mars. For example, NASA's Opportunity rover found multiple deposits of odd, iron-rich spherules after landing on the Red Planet in January 2004. These so-called "blueberries" are concretions created by the action of mineral-rich water inside rocks, scientists say. Opportunity's twin, Spirit, discovered strong evidence of an ancient hydrothermal system near its landing site back in 2007. And last December, researchers announced that Opportunity had found a thin vein of gypsum while poking along the rim of Mars' Endeavour Crater. "There was a fracture in the rock, water flowed through it, gypsum was precipitated from the water. End of story," Steve Squyres of Cornell University, Opportunity's principal investigator, told reporters at the time. "There's no ambiguity about this, and this is what makes it so cool." Here on Earth, life thrives pretty much anywhere liquid water is found, which explains the intense interest in searching for signs of the stuff on Mars. Indeed, the past decade or so of NASA's activities at the Red Planet have been geared toward "following the water." Curiosity's mission marks a transition to the next phase in the hunt for past or present Mars life: searching for habitable environments. Curiosity is about 50 days into a two-year mission to determine if the Gale area can, or ever could, support microbial life. This is a long and involved process that requires more than the confirmation of an ancient streambed, researchers said. "The question about habitability goes just beyond the simple observation of water on Mars to recreating the environments in greater detail, with an understanding of the chemistry that was going on at that time, to ask if this is the kind of place that micro-organisms could've lived," Curiosity chief scientist John Grotzinger, of Caltech in Pasadena, told reporters Thursday. "That's still to be determined, and that's the research the team is working on," he added. Curiosity's mission may also shed light on when and why Mars dried out long ago. Scientists plan to drive the 1-ton robot partway up Mount Sharp, which rises 3.4 miles (5.5 kilometers) into the Red Planet sky from Gale's center. They're keen to explore Mount Sharp's base, which harbors clays and sulfates, orbital observations have shown. About 2,300 feet (700 meters) up, however, these deposits peter out. If Curiosity climbs high enough to cross this threshold, it could help scientists piece together a history of wet Mars, dry Mars and the transition between the two, researchers have said.